Genuine or certified lightning cables will have the MFi Logo on the packaging, The cable itself will have “designed by Apple in California” stamped on it and either “Assembled in China,” “Assembled in Vietnam,” or “Indústria Brasileira” stamped on it about 7” from the connector along with a serial number consisting of 12 or 17 characters. Certified cables have the company brand stamped on the connector end. The Support website goes into great detail, with images, showing genuine connectors compared to fake ones, including the length and width of the cable, along with any marking you can expect to see. The 30-pin connector is still in use on the iPhone 4S or older and Apple shows what a genuine one should look like compared to a fake connector. They also provide the same details for the micro USB adaptors. 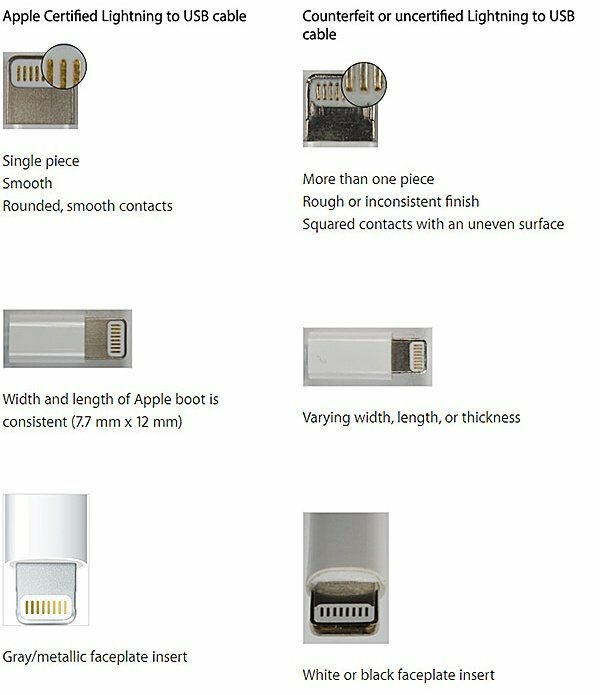 You can find the full article here [ Apple Official ] and, as you can see they go into detail about each connector is constructed as well as what it looks like at first glance. By producing these details, Apple is hoping that they can significantly reduce the number of problems caused by people using fake cables, whether they realize it or not.